Family Nurse Practitioner, Julie Hughes, is welcoming new patients at the Good Shepherd Medical Group in Hermiston. HERMISTON OR – Good Shepherd Medical Group (GSMG) is excited to announce that Family Nurse Practitioner (FNP) Julie Hughes is welcoming new patients at the Good Shepherd Rural Health Clinic in Hermiston. 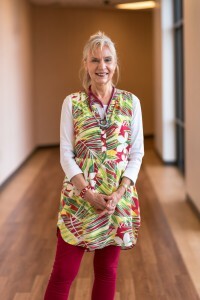 Ms. Hughes has been a practicing FNP since 1993 when she graduated with her Master’s of Science in Nursing from Oregon Health and Sciences University in Portland, Oregon. Since then, Ms. Hughes has been providing care in rural communities in Eastern Oregon. In addition to practicing medicine, she also seized an opportunity to teach the next generation of aspiring nurses at Blue Mountain Community College from 2001-2003. In addition to her education skills, Ms. Hughes prides herself on providing a comprehensive examination, “I believe patients appreciate my thoroughness when addressing their concerns. I really like reviewing previous visits and learning a complete medical history. It’s important for me as a provider to know as much as possible so I can make the most accurate diagnosis possible,” shared Ms. Hughes. When not at work Ms. Hughes enjoys spending time with her two Scottish Terriers, playing the piano for her church, and is a television true crime connoisseur. Julie Hughes FNP is now welcoming new patients Wednesday through Friday at the Good Shepherd Medical Group Rural Health Clinic located at 600 NW 11th Street in Hermiston. To schedule an appointment call 541.567.3505 or visit http://www.gshealth.org/good-shepherd-medical-group/family-practice/.